Each time I’ve surveyed my ginormous mountain of veggies these past few weeks, I cannot help but think of the cover of our own local Diane Morgan’s new cookbook, Roots. See the similarities?!? Good thing there are many such foodie geniuses who recognize the allure and earthy goodness of the root vegetables that grow so abundantly in the Northwest. Amazing, the transformation that can take place from some of these hairy, knobby, truly foreign looking beings to a thing of beauty and deliciousness at the dinner table! Add in the locally foraged mushroom from Hood River Organic (and the decadent baguettes they deliver! ), and we’ve got ourselves a week of dinners not-to-be-missed! Wednesday – National Pie Day! See last week’s blog post for tips and tales about Friday Night Pizza. Any winter squash will do for this – this week I got beautiful, green kabocha squash. DO NOT BE AFRAID! Treat it just like acorn. Pre-bake the squash (halved, seeds out, face down) a bit before you try to slice and peel – just makes the process easier. Then just adjust your cooking time for the rest of the recipe accordingly. While the garnishment of the parsley, sage, and lemon I’m sure is delicious, skip it if it sounds too fussy. I’m going to include half of my freshly foraged mushrooms! Add sausage, prosciutto, or whatever strikes your fancy. And remember, the dough is enough for three pizzas – if you have someone who will wrinkle their nose at the idea of squash pizza, make one a tried and true pepperoni! I decided to do something crisp, bright, and crunchy this week with my oh-so-ugly (but truly loved) celery root. Maybe it’s the sunshine, or maybe I just had to find an excuse to try my hand at homemade mayonnaise after watching James Beard do it on stage at PCS. Use what looks right in this “French coleslaw”, then enjoy surprisingly delicious lunchtime sandwiches all week! OR, if the desire to make homemade mayo has never struck, use purchased and doctor it up a little with Dijon and lemon juice. Couple with a super simple baked tilapia (New Seasons special this week!) or any fish; I’ll use lemon juice instead of lime. Well, not my heart-healthiest of menu items. But, YUMMY looking, and a fabulous way to highlight my HRO mushrooms. I’ll increase the pasta quanity to a full pound, knowing how my family devours it. And I’ll lighten it up just a tad by using chicken or turkey sausage. You could easily make this vegetarian by skipping the bacon and sausage, and doubling the mushrooms! I make chilled beet soup quite often in the summer months. But this savory, warm version looked both simple and delicious. Based on the reviews, I’ll reduce the water and possibly increase the chicken broth for added flavor. I always prepare my beets as soon after delivery as I can – throw them in the oven whenever you’ll be home for an hour or more. I roast, wrapped in foil in a hot oven, for an hour or more, cool, peel (peels should just slip off with fingers), and slice them into wedges, and then they’re ready for any recipe. This soup, one of my delicious HRO warm baguettes, and voila, a weeknight meal anyone would love! Well, anyone who loves beets. Again, add a go-to New Seasons roasted chicken if the meat will be missed. Mexican is a favorite in our house, and I twist and turn almost any recipe to fit my veggies at hand. Any winter squash could be used here, and just like the beets, during a non-crazy, non-dinner-time hour, cut, seed and roast the squash slices so they’re ready to roll. Although I’m sure homemade roasted poblano chiles are incredible, I’ll skip that time consuming ingredient, either all-together, or just add jarred roasted peppers. Add a can of black beans to the mix to get the full-meal-deal. I’ll have purchased tomatillo salsa, plus another couple of favorites for a fun salsa-sampling kind of dinner. OK, on National Pie Day, we just must have PIE and PIE for dinner! As I was pondering where my “pie friend” Liz and I might meet to honor the day, she proposed the perfect idea…Pacific Pie Co (get your entries into the pie contest for Sunday’s competition!). In perusing their site, I stumbled across this amazing-sounding Aussie-style savory pie recipe. It looks like the full recipe serves many, but I’ll go for it, knowing leftovers are a good thing. I’ll cut the beef in half and add more carrots, plus parsnips, and substitute leeks for onions. I won’t bother with the individual ramekins, but will just use any large lasagna-style baking pan that I have. Looks like you could make it all ahead, except for placing the store-bought puff pastry on top for the final baking. 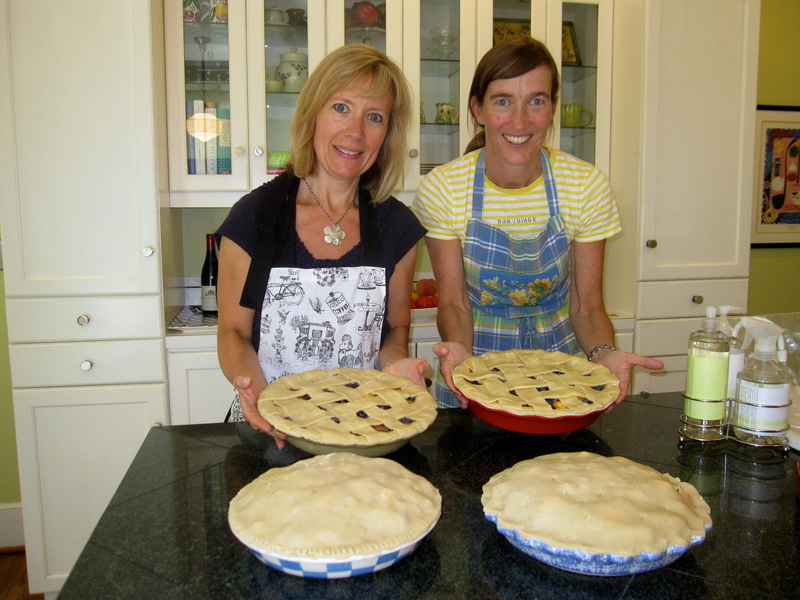 And for the dessert…homemade pie is the most fun and fabulous, of course! BUT, given life’s obligations and complications, probably more realistic to let someone else do the home baking for you! Here’s a listing of some local favorites (Sweet Dreams of Portland Pies, OregonLive) – I would add Baker & Spice to that list for sure. I’m going to be hard pressed not to make the trek to Bipartisan Cafe to bring home one of their out-of-this world chocolate cream pies – truly dreamy! That would make it a 3-pie-day, which I think is OK. After all, it has been nearly four weeks since Christmas pie! New Seasons…my weeknight friend. Orange chipotle turkey sausage links are on sale this week. Cook them up in a skillet, and serve them with simple oven-roasted potatoes (I’ll halve this recipe), and parsnip and carrot “fries” as we call them. This is a go-to at the end of a CSA week – cut up whatever remaining parsnips and carrots I have, and make fries! You can put the potatoes and the parsnips and carrots in the oven at the same time, just stirring each occasionally until everything is browned.